Homemade Baby Shower Favors | Making Baby Shower Favors With A Personal Touch! Making Homemade Baby Shower Favors is easy with our ideas for DIY Baby Shower Favors. Add that personal touch by making baby shower favors a special gift for your guests. Do-It-Yourself with easy to make, or buy, candy, cookies or trinkets related to your theme. 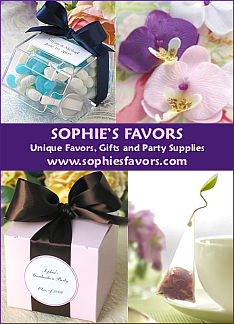 Box, bag or hand wrap your favors using our many excellent packaging ideas (more below). Also visit Beau Coup's DIY Ideas Gallery to see more excellent ways for making baby shower favors! Tip: Remember to also check out the Bridal Shower Favors as they make very elegant baby shower favors. Just change the Personalization Wording! We have some Fun DIY baby shower favors and ideas. First, think of something memorable that you could make. Choosing a thoughtful and easy theme related gift to thank your guests for being with you on your special day makes them feel special too! Give everyone a cut flower (buy them in bunches at the local grocer). Attach a packet of seeds, or a seeds favor tin to the flower and ask your guests to plant them in honor of the new baby. Buy some inexpensive baby socks, fill them with candies and tie them in pairs with a blue, pink or yellow ribbon. Check out our very cute collection of baby shower ribbons. For a creative baby shower candle favor, cut circles of organza fabric, or tulle. Place a small amount of potpourri in the middle. Then place a coordinating scented candle on top of the potpourri. Bring all edges to the center and tie with a colorful ribbon. "Making baby shower favors is a fun and economical way to provide a personalized favor gift for your guests!" Bake or buy some yummy baby shower cookies and wrap them in colorful plastic wrap. Assemble them in a hand-painted decorative bag or use one of these unique baby shower favor bags. Or, place them in a colorful small Chinese restaurant carry-out boxes, found on our baby shower favor box page. Tie with a pink or blue ribbon. This is perfect for Asian themed baby shower favors. Mini cinnamon buns (you can use the ready-to-make type), wrap them in colorful plastic wrap, tie with a card saying “Thanks for joining us to celebrate (Mom-To-Be’s name) bun in the oven!” Take a look at our baby shower favor tags and labels for more custom and DIY baby shower favors and ideas. Buy some inexpensive cloth napkins, or nicer paper ones and put personalized Hershey's Kisses, M & M's, M & M shaped chocolate mints, nuts, jelly beans or other baby shower candy inside. Fold up like a diaper and use a baby pin to close. Take mini baby bottles or personalized jars and fill them with pastel M&M’s. Tie them with colorful ribbons for quick and easy homemade baby shower favors. Tip: Whether you're making homemade baby shower favors, or purchasing them, remember to use them as decorations and invite your guests to take one as they leave! How To Make Homemade Baby Shower Favors! Easy to make ... or buy baby shower candles wrapped & ready to give! Delight guests with gable gift boxes, take-out boxes, popcorn boxes .. Learn to use personalized favor ribbon and gift bows for a professional look!